What barriers have you put up to protect yourself? They may have given you a sense of security against real or imagined threats but today's message is that they are no longer needed. It's time to let them go. Through dropping them you will enable a few things to happen. You'll experience freedom to move forward without hinderance, and will create more space - it will no longer be necessary to play small. Instead you can expand, allowing love and healing to flow. 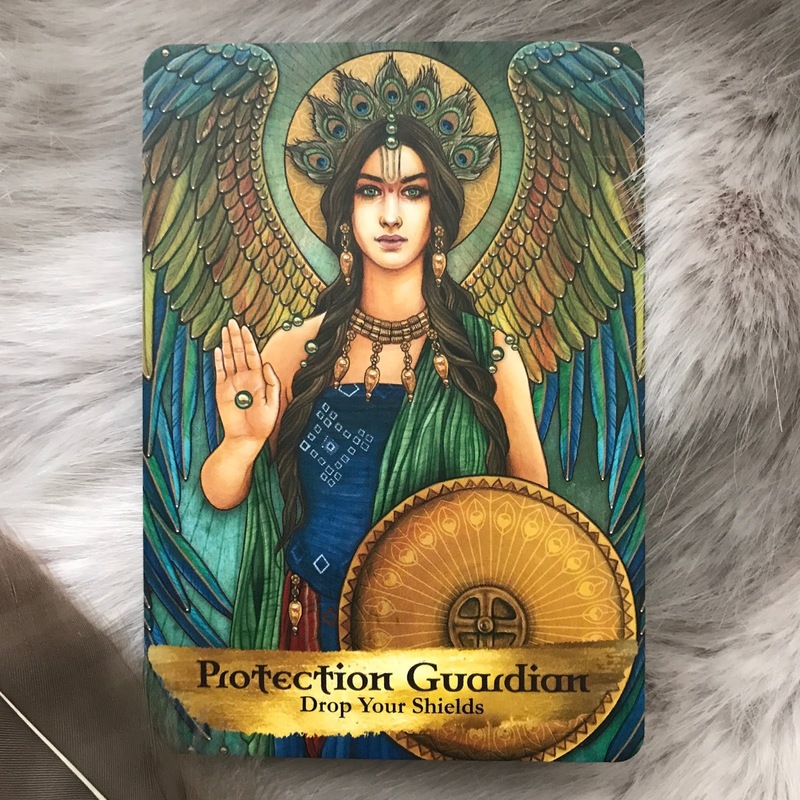 With nothing to hide behind, you may feel afraid, but Michael is known as the Archangel of protection and strength, and can help us to overcome our fears. Michael's energy is depicted here in female form as the Protection Guardian. She is saying it's safe for you to step forward. Her hand is raised in greeting, her right palm chakra alight. Fear (in any form) that you may have experienced in the past, or are projecting into the future is meaningless, unless you CHOOSE to give it meaning or power. But why would you do that? Peacock markings are prominent on the Guardian's lowered shield and her headdress - while they symbolise different things in various traditions, in this context I believe they are saying to you that showing your true colours will be a glorious thing - you have a beautiful message to share. In Kyle Gray's book 'Angel Prayers', a message from Archangel Michael includes this line: "There is a great light inside you that is desperate to shine, and I am here to help you. Call on me to dissolve the barriers and blocks that hold you back so that you are able to stand strong and share." Whether or not you choose to call on this energy for assistance, trust that it is now safe to drop your shields.